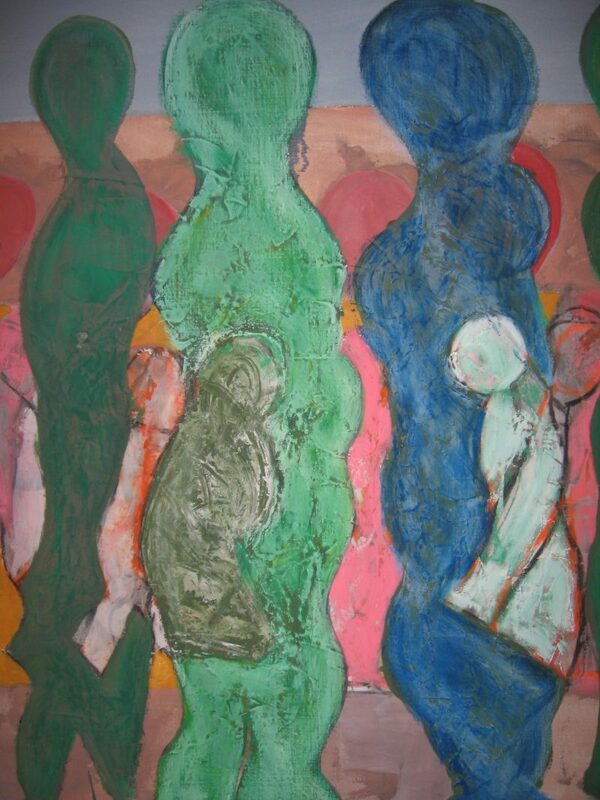 In the summer of 2012 he began work on a diptych he called “A Predella for the Green Man” (Mixed media on two canvas panels, together measuring 42 inches high by 12 feet long.) The progress of the work from summer 2012 to January 2013 was documented in photos by Sanjay Agnihotri and Martha King (with the more amateur shots by MK). See the slide show here. What is a “predella” anyway? Reference books say it was originally kind of step at the bottom of an altar. Possibly communicants knelt there to be close to the huge image above. Was it simply to give depth to the big panel? 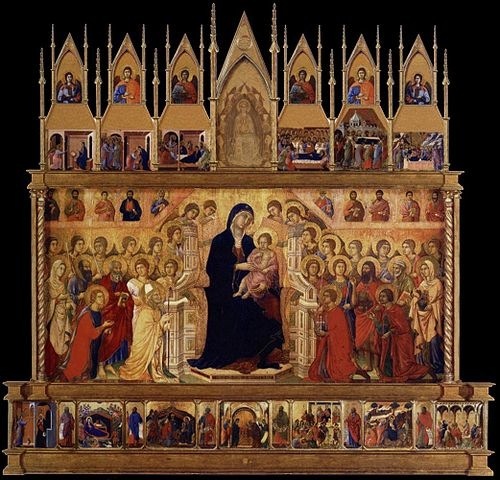 But when Duccio di Bouninsegna created the “Maesta” altar for the Siena Cathedral in 1308 he used the space for a row of small images, a narrative, a back story about the childhood of Jesus, and artists following him soon elaborated on this practice enlivening the whole idea of an altar. Predellas did retain part of their original function – they were always made to be seen close up. A recreation of Duccio di Bouninsegna’s Maesta altarpiece in Siena Cathedral. (The altar was dismembered and pieces of it dispersed. ) Photo from Wikipedia Commons. Basil King’s predella shows action, making me wonder what the large painting above it would be if it existed. It would have to be ten or twelve feet high, and perhaps shaped in some way at the top and sides, this ghostly Green Man. Would we see his face only? His chest and hands? His women and children, his leaves, and snakes and berries, his alleyways, els, bridges, slums and palaces? 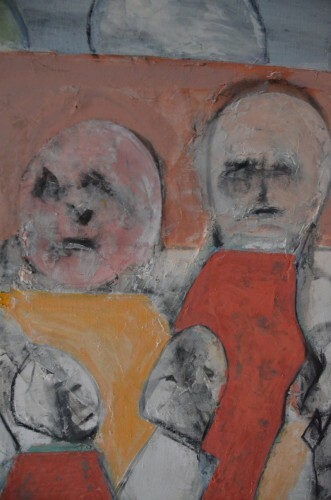 Is this uncertainty part of King’s painting? Is this so we will all go “looking for the Green Man”?